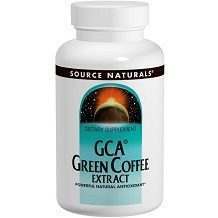 Source Naturals GCA Green Coffee Extract Review - Does it Work? 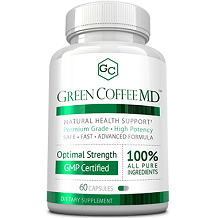 Source Naturals GCA Green Coffee Extract promotes its “GCA” formula which it claims is a source of potent antioxidants which will help prevent oxidative stress in the body by working at eliminating free radicals that can damage the cells. The manufacturer also says this will help the healthy cells to grow and regenerate. In our review of Source Naturals GCA Green Coffee Extract, we look at the product in detail to help you narrow down your purchasing choices at either add it to or delete it from your short-list. This supplement contains green coffee bean extract at 45% – 50% concentration yielding 450 – 500 mg of CGA per two-tablet serving. As noted, this green coffee bean extract is said to help with overall health through its antioxidant properties which reduce the damage potentially caused by free radicals in the body. We find it interesting that, unlike practically every other green coffee supplement manufacturer, no claims are made that this particular product helps with weight loss or fat burning. The recommended dosage is somewhat flexible with instructions saying one to two tablets should be taken once or twice a day. This gives a range of one to four tablets daily but doesn’t provide all that much guidance for a given individual. This supplement should not be used by women who are pregnant or looking to become pregnant in the near future or by women that are breastfeeding. People who are sensitive to caffeine should talk to their healthcare provider before use. This product is not suitable for children. You cannot purchase Source Naturals GCA Green Coffee Extract from the manufacturer’s website, although pricing is noted on the website. A bottle of 30 tablets is priced at $16.98 while 60 tablets are set at $32.50 and 120 tablets go for $63.50. There is no guarantee information on the company’s website. Source Naturals GCA Green Coffee Extract tries to create a niche for itself in the jam-packed green coffee supplement category by emphasizing its “anti-aging” properties, namely the antioxidants its formula is said to contain. It completely ignores the hype around green coffee’s purported weight loss and fat-fighting abilities. Does it stand out from the crowd or get lost by not even being part of the crowd? We’ll leave the marketing gurus to debate that question although it’s one that can also play a part in your purchasing decision. What we can say with certainty about the product is that it is priced competitively. What we’re not such fans of is the fuzzy dosage instructions and the fact that the manufacturer does not provide a money-back guarantee for its product. In addition, this is one of the few health supplements we’ve seen where (at least at the time of our review) the number of negative customer ratings on Amazon were equal to the number of positive ratings. We would suggest looking for a product (and there are lots of them) with positive Amazon feedback of at least 70% and negative feedback under 20%.